Technology | Process Technology | NAKATA MFG. 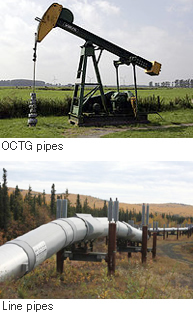 CO., LTD.
High quality pipes produced with our advanced manufacturing equipment are used everywhere. High grade casing pipes (such as N80) and Line pipes (such as X80) are easily producible with FFX mill high forming functions. Along with current energy saving trend and the recent advancement of hydro forming technology, new pipe applications are developing in the automotive industry. Pipe bending and expanding by hydro forming requires high quality pipes with low residual stress. Pipes produced by FFX mill have very low internal forming stress, and they are very suitable for hydro forming and bending. 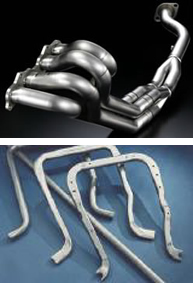 Current production of austenite stainless pipes uses TIG welding that slows down manufacturing speed. In recent years, lasers with better productivity are getting attention. Laser welding requires very tight tolerances for edge shape at seam line. FFX mill's stable forming can bring the potential production speed of laser welding line to its maximum level. 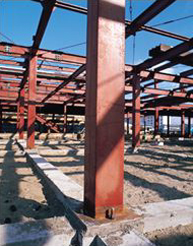 The most popular method of forming square pipes is producing round tube first. It is then formed into a square cross section by 5-8 stands in the following sizing process. Size forming uses a dedicated roll set for the specific size. The roll box forming method we developed enables common-use rolls and reduces costs related to rolls while improving product quality.